Brush Mountain Ranch is the home of Whispering Pine Lodge and Cabins. We have accommodations for single travelers, families, and larger groups. 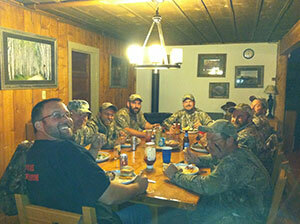 Our main lodge has a large dining room that seats as many as twenty people. There you will enjoy delicious meals prepared by our kitchen staff. We will work with you to accommodate individual tastes and any diet restrictions you may have. For a bit of social entertainment and relaxation the lodge is complete with a pool table, stone fireplace, and satellite internet and television. The lodge is a great place to gather with others and watch a football game while taking a break in the day. If you need to stay in touch with the rest of the world during your stay, you will find communication services to be modern and reliable. Our ranch manager is always available to assist or answer any questions – making sure everyone has an enjoyable stay. All of our lodging facilities are updated with modern kitchens and baths with showers, televisions, and wireless Internet. Cabin 1 – This is our coziest cabin. It has a queen-size bed, a twin bed, a propane stove and a kitchenette. Cabin 2 – This cabin is comfortable and a little larger than Cabin 1. With a queen bed and two twin beds, this cabin is perfect for a small family. Cabin 3 – Cabin 3 is equipped to sleep groups of up to 6. It has a kitchenette, propane heater, and 3/4-bath. 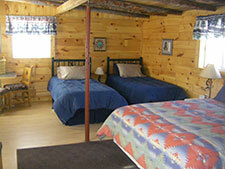 To enhance your enjoyment of the mountains, Cabin 3 is directly adjacent to our sauna and hot tub. Cabin 4 – Cabin 4 has a queen-size bed and two twin beds and is suitable for a family of four. Cabin 4 has a full kitchenette, and a 3/4-bath. The historic schoolhouse features two bedrooms and one bath. The well equipped kitchen has all the modern conveniences of home. The Schoolhouse provides updated amenities while maintaining a rustic ranch experience. 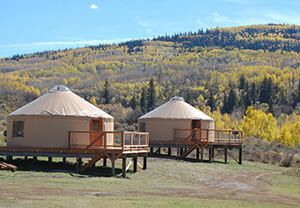 At the ranch there is a 30-foot yurt, which sleeps 6 to 8 people, and two 24-foot yurts, sleeping 4 to 6 people. We invite larger families to join us here on the mountain in the spring and summer, and the yurt is one way to provide a one-of-a-kind experience. Yurts are a wonderful addition to the accommodations we offer, and a great alternative to traditional lodging.